Cosmetic Dentistry can give you the smile you’ve always wanted. If you have the desire to correct chipped, dull, discolored, or missing teeth, we can provide cosmetic dental solutions that range from simple improvements to more complex treatments. Call for a consultation today! For new patients who receive an exam, cleaning and digital X-rays, ask about our custom bleach tray promotion. For a limited time only and while supplies last! This promotion cannot be combined with others. Limited 1 per customer. See our Patient Specials section. Custom designed full-coverage porcelain crowns replace broken and root-canal treated teeth. These thin, porcelain shells are bonded to the teeth that can change the color, length, width and shape of teeth. If you are unhappy with your front teeth, porcelain veneers are often a conservative treatment. 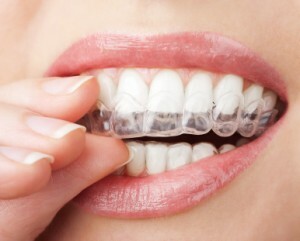 Professional teeth whitening is available in our office. Ask us today! Crest Professional Strength White Strips give you the whitening boost. Another option is making custom bleaching trays and supplying you with take-home gel – an alternative way to achieve long-lasting results.